This beautiful white winter weight soft acrylic knit outfit is made by Sarah Louise, a top British designer of classic baby garments. The sweater features a cable design on the front centered by three decorative buttons. 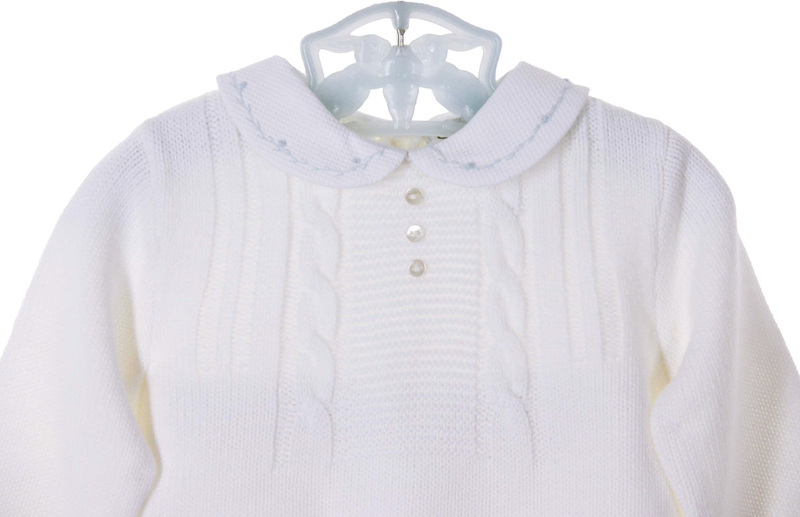 The white pique collar is embroidered in blue. Long sleeves with knit cuffs and a back buttoned closure finish the sweater. The long pants have an elasticized waist for flexible fit and knit cuffs. 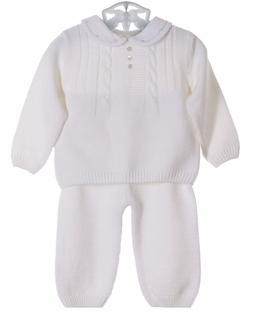 This beautiful little warm knit pants and sweater set is the perfect take home outfit or christening, baptism or dedication outfit for your baby boy. This sweet set is also available in blue. Coordinating one piece romper is also available. See below.